Here at Peck & Chisel, we have a variety of carefully crafted, hand made wooden bike racks available. 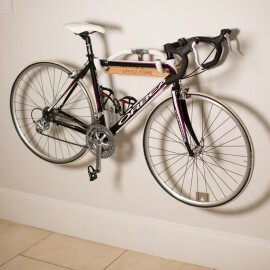 These wall-mounted, personalised wooden bike racks come in a variety of styles. Our popular “Oak Shelf” model is hand crafted from Oak into a chic, yet simple shelf design. Completely personalised with our own vintage pantograph machine, your bike rack comes with up to 16 characters lovingly engraved on the front edge. Our standout “Walnut Shelf” model follows the same design, and comes with the same engraving options as its oak counterpart, but is crafted from beautiful and tactile American Walnut,hand finished by our dedicated staff; ideal as a gift or to reinvigorate the style of your practical storage space at home. 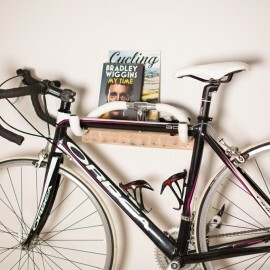 Some of our more complex wooden bike racks make for stunning fashion statements, as well as practicality. 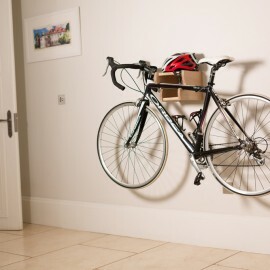 Our “Counterbalanced Box Bike Rack” is made for the avid, high performance cyclist. Designed specifically for the sloping-top tube bike, this masterpiece of practical design not only holds your bike, but comes with two storage areas ideal for your equipment, and a resting place for your helmet (don’t forget to wear one!). Available in three different, but equally gorgeous, types of wood: White Wax, Oiled Oak and Oiled American Walnut, this is a stylish bit of kit ideal for the committed bike-rider. 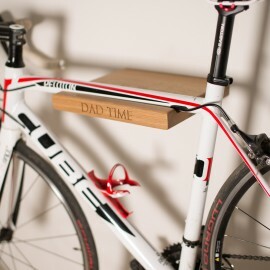 For a really bespoke wooden gift, to a friend or to yourself, look no further than our “Retro” wooden bike racks. 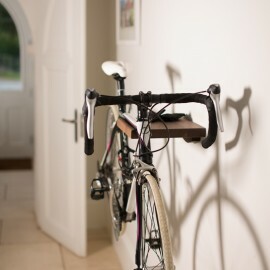 They are truly unique, with your option of white or black handlebars perched upon either finished oak or reclaimed pine shelf, this rack stands alone as a piece of art in your home while your bike is elsewhere. Please browse all of our varying styles to see which best suits your personal style, or the wants and needs of the lucky recipient of your gift. If you have any questions about any of our models, design options or prices, please don’t hesitate to get in touch with our team today!